India Art Fair, the leading platform to discover modern and contemporary art from South Asia, announces the full list of participating galleries and programme highlights for the 2019 edition. Taking place from 31 January – 3 February 2019 in partnership with BMW Group India, India Art Fair 2019 will present 75 exhibitors from 24 Indian and international cities. Evolution and expansion of the events programme both on- and off-site will offer visitors unique access to the breadth and strength of India’s thriving visual art scene. The 2019 edition of India Art Fair will feature a diverse selection of contemporary art galleries from across India including Chatterjee & Lal, Jhaveri Contemporary, Galerie Isa, Project 88, Chemould Prescott Road, Sakshi Gallery and TARQ (all Mumbai); Exhibit 320, Nature Morte, Shrine Empire and Anant Art (all New Delhi); Kalakriti Art Gallery (Hyderabad), Experimenter (Kolkata), GALLERYSKE (Bangalore) and ZOCA (Ahmedabad). The fair will also continue its strong tradition of presenting important work by the region’s leading Modernists. Returning participants will include some of India’s oldest and most respected galleries, DAG and Dhoomimal Gallery (both New Delhi), who will exhibit masterworks by artists including Raja Ravi Varma, Tyeb Mehta, F. N. Souza, Akbar Padamsee and Ram Kumar. International galleries participating in India Art Fair for the first time in 2019 willincludeneugerriemschneider (Berlin, Germany), and Sokyo Gallery (Kyoto, Japan). Returning international galleries include David Zwirner (London, UK/New York, USA/Hong Kong), Blain | Southern (London, UK/Berlin, Germany), Aicon Gallery (New York, USA), Lukas Feichtner Galerie (Vienna, Austria), 1X1 Art Gallery (Dubai, UAE) and Arario Gallery (Cheonan / Seoul / Shanghai). This year’s Focus section, which showcases solo presentations curated by participating galleries or institutions, will feature seven artists: Vadodara-based artists Bhagyashree Suthar (Akara Art) and Prajjwal Choudhury (Gallery Latitude 28); Pakistani artist Aisha Khalid (Anant Art); Delhi-based artist and educator Sumakshi Singh (Exhibit 320); Thota Vaikuntam (Kalakriti Art Gallery); Mumbai artist Aditi Singh (Thomas Erben Gallery / Chemould Prescott Road); and eminent Indian painter, sculptor, writer and architect Satish Gujral (Chawla Art Gallery). Throughout the fair, visitors will encounter eleven Art Projects, ranging from large-scale interactive installations to sculptures and video work. In this section, self-taught artist Baaraan Ijlal (Shrine Empire) will present her sound installation Change Room, and Manisha Gera Baswani (Gallery Espace) will exhibit her Postcards from Home series, which details accounts from artists affected by Partition. GALLERYSKE will create a pop-up concept store offering artist designed products, and sculptors Shanthamani Muddaiah (Gallery Sumukha), Shalina Vichitra (Gallery Art.Motif) will also be displayed, alongside an immersive experience from architect Pinakin Patel (Emami Art) and video project by Madhusudhanan (Vadehra Art Gallery). Platform, a popular section of the fair that acts as a springboard for emerging art practices and art collectives from South Asia, will welcome back TAF: Tribal Art Forms, Delhi Crafts Council and Blueprint 12 (all New Delhi) as well as Swaraj Art Archive (Noida) and Britto Art Trust (Dhaka, Bangladesh). Metta Contemporary (Navi Mumbai) will exhibit at the fair for the first time. Leading cultural organisations and foundations from the South Asia region will include the Foundation for Indian Contemporary Art (FICA), Kiran Nadar Museum of Art (both New Delhi), Museum of Art and Photography (MAP) (Bangalore), and the Bengal Foundation (Dhaka). Inlaks Shivdasani Foundation, will show works by recipients of the Inlaks Fine Art Awards throughout the fair. These will be joined by New Delhi-based international bodies Italian Embassy Cultural Centre and Korean Cultural Centre India. The fair programme will reflect upon the changing face of the global art community with Forum, a platform encouraging opportunities aimed at the younger generation. This year’s guest curator Sitara Chowfla, a writer, researcher and curator based between London and New Delhi, will celebrate critical experimentation and the work of artists, curators, institutions, critics and collectors across the globe. Forum will include performances and talks by internationally renowned artists, extending into the main gallery halls with Forum Projects, including When All Roads Are One by New York-based artist and designer Ghiora Aharoni. Outside the fairgrounds, new initiative IAF Parallel will see collateral events programmed by galleries, museums and art spaces across New Delhi. Highlights from IAF Parallel include Bharti Kher’s solo exhibition at Bikaner House; the opening of an exhibition dedicated to eminent artist Upendra Maharathi at the National Gallery of Modern Art (NGMA); Arpita Singh’s retrospective at Kiran Nadar Museum of Art; a special exhibition by Foundation for Indian Contemporary Art (FICA) at the Indira Gandhi National Centre of the Arts (IGNCA); and exhibition walkthroughs in Lado Sarai, a contemporary arts hub in South Delhi. Presenting Partner BMW Group India will showcase the 14th BMW Art Car by David Hockney – BMW 850 CSi, 1995. Since 1975, nineteen prominent artists from across the world have created Art Cars on the basis of contemporary BMW automobiles of their times, all offering a wide range of artistic interpretations. 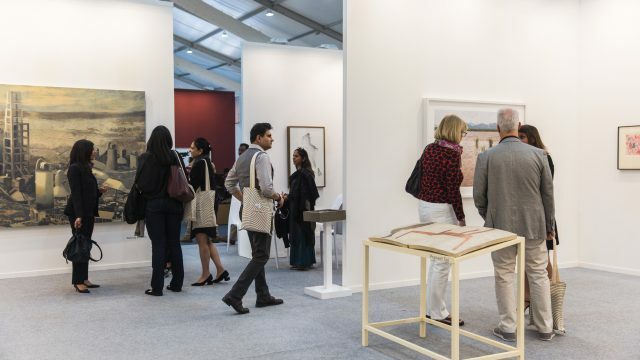 In addition, BMW Group India will continue to support India Art Fair satellite events throughout the country, further extending the fair’s reach.